SHANGHAI—A spike in air pollution in Beijing and other Chinese cities has brought concern over auto fumes to the fore in the world's largest car market, but analysts say trucks and older cars—rather than new passenger vehicles—lie at the heart of China's current pollution woes. China overtook the U.S. as the biggest auto market by number of new vehicles sold in 2009. Last year, Chinese customers bought 19.3 million vehicles, a figure the semiofficial China Association of Auto Manufacturers forecasts will grow a further 7% this year. A fourth day of severe pollution across large parts of China has put scrutiny on industries that contribute to China's pollution problems, including auto makers, power companies, steel makers and other firms. China has fewer cars on the road than the U.S.—92.7 million compared with about 245 million. But according to China's Ministry of Environmental Protection, only 5.7% of China's vehicles meet the country's highest national Grade IV standards that limit toxic emissions from vehicles including greenhouse gas and tiny particulate matter known as PM2.5. The majority meet relatively low emission standards. The 10% of vehicles that don't meet the minimal Grade I emission standard account for 40% of the total emissions of major pollutants, the ministry said. "Mitigation of the problem lies much more in getting rid of old vehicles and improving traffic flow," said Janet Lewis, an analyst at Macquarie Securities. Public outcry about the recent spike in pollution could also motivate the government to re-examine its once-ambitious plans for electric vehicles, implementation of which have recently stalled. Long term, the current pollution crisis could prompt a rethink of Beijing's policy on electric-vehicle technology, said Bill Russo, founder and president of auto consulting firm Synergistics Ltd. and a former Chrysler executive. "If pollution is becoming a very visible problem, then it could change attitudes about alternatives" such as clean diesel and conventional hybrid engines, he said. Last year, the State Council, China's cabinet, said it hopes output of pure electric and plug-in hybrid vehicles reaches 500,000 by 2015 and 5 million by 2020. However, progress has been slow on more immediate steps. For example, China has twice delayed the nationwide rollout of tighter vehicle-emissions standards amid opposition from the refining industry. Tighter emission standards have also met with resistance from truck-engine manufacturers as well as buyers of trucks. A.T. Kearney consultant Stephen Dyer estimates the additional cost for engine makers to comply with stricter rules at around 10,000 yuan (about $1,600) per engine. "While this may only represent 5% of the total cost, engine makers say it's enough to significantly impact sales," he said. The Environment Ministry said in January 2012 that the National IV standards would be applied to diesel-engine vehicles from July 2013. China has other options, such as promoting the scrapping of old vehicles. Last year, the city of Beijing offered financial incentives to car owners to get rid of older cars. But the amounts involved were modest—up to around 16,000 yuan for larger cars. Lin Huaibin, manager for China vehicle-sales forecasts at research firm IHS considers such incentives "a start" toward increasing the scrappage ratio in China, which currently stands at around 3% of total registered vehicles, considerably less than the U.S. rate of around 8%. Mr. Lin said it's "pretty likely" that other Chinese cities will follow in the steps of Beijing. The latest pollution episode also could see more Chinese cities introduce restrictions on auto purchases. Last year, the southern city of Guangzhou and the southwestern city of Guiyang joined Beijing and Shanghai by putting car-ownership restrictions in place that seek to relieve traffic conditions and limit air pollution. It is unclear whether such moves could specifically result in a fall in auto sales. Macquarie's Ms. Lewis said she didn't expect any further restrictions on the purchase of new vehicles as a consequence of the recent pollution problems. 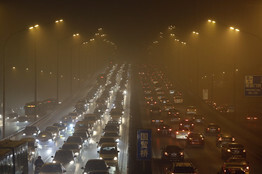 Beijing had about five million vehicles on the road at the end of 2011 or 260 vehicles per 1,000 people. As of the end of 2011, Guangzhou had 2.33 million vehicles on the road, meaning 180 vehicles per 1,000 people, according to a government-affiliated transportation think tank in the southern Chinese city. There are more than 800 licensed vehicles for every kilometer of road in Beijing, data from the Beijing government show, compared with 306 vehicles in Hong Kong and 520 vehicles in Shanghai. Globally, about one third of polluting emissions can be attributed to transportation-related sources, said Mr. Dyer of A.T. Kearney. Of this, about one-third is linked to passenger cars, one-third to commercial vehicles and the rest to other forms of transportation including airplanes and ships. However, in the case of Beijing about 50% of harmful emissions are caused by transportation sources, he said. —Rose Yu contributed to this article. A version of this article appeared January 15, 2013, on page A12 in the U.S. edition of The Wall Street Journal, with the headline: Older Cars Clog Air in No. 1 Market. (Reuters) - Vehicle sales in China are set to rise 7 percent in 2013, a third straight year of single-digit growth, an industry association said on Friday, as the fallout from a diplomatic spat continues to weigh on Japanese automakers. Sales in the world's biggest auto market rose 4.3 percent last year, up from 2.5 percent growth in 2011. But that is still far below the robust double-digit expansion seen in 2009 and 2010 as a slowing economy and rising fuel costs weighed on demand. China sales for Toyota Motor Corp (7203.T) and other Japanese carmakers initially tumbled by half after a territorial row caused an outbreak of anti-Japanese sentiment in mid-September. But while declines in sales have slowed, most industry analysts say they will likely continue to lose market share to other foreign rivals in 2013. "People no longer take to the street or smash Japanese cars anymore and Camry, Accord or Infiniti models have again become an option. But a full recovery is going to be very difficult as long as the island dispute remains unresolved," said Sheng Ye, an analyst at industry consultancy Ipsos. "That will drag down the overall car sales to some extent even though Korean, German and American brands have picked up some of the slack." However, Dong Yang, secretary general of the China Association of Automobile Manufacturers (CAAM) was more optimistic, saying Japanese brands might make a full recovery this year. "I think they can fully recover this year," Dong told a news conference. "As for whether it (the recovery) will be for the short-term or long-term, I think the ball is in the court of the Japanese government." While total vehicle sales are likely to rise 7 percent this year, passenger car sales will do slightly better, climbing 8.5 percent, Shi Jianhua, CAAM's deputy secretary general, said. The auto association forecast is roughly in line with a poll of senior industry executives in China conducted by gasgoo.com. According to that poll, half a dozen executives expect the overall vehicle market to grow at a single-digit pace this year while the other half predict growth of about 10 percent. Further weighing on demand, more local governments may move to restrict car sales, an initiative already imposed in Beijing, Shanghai, Guangzhou and Guiyang to help ease traffic gridlock. The most recent curb imposed in Guangzhou in August will cut the city's annual vehicle sales by a third. Still, China -- which contributed to a third of light vehicle sales growth worldwide over the past five years -- presents automakers with huge opportunities due to the country's expanding urban middle class and low-car ownership in the country's sprawling inland areas. In 2012, automakers shipped 19.3 million passenger cars, trucks and buses to dealerships in China, the association said. In December, vehicle sales rose 7.1 percent from a year earlier to 1.81 million, slower than an 8.2 percent gain in November. Passenger vehicles sales, which rose 7.1 percent to 15.5 million in the country last year, are expected to top 20 million in 2020, accounting for nearly 60 percent of the Asia-Pacific region's overall volume, according to Bill Russo, a senior adviser at Booz & Co.